But, what if that luxurious-smelling body wash is harming your body? Most of the bath and shower products on the market contain harmful toxins and chemicals that can seriously affect your health. From synthetic hormones to carcinogens, the ingredients in our body wash that should be nowhere near our bodies. To learn exactly what’s inside our bath and shower products and what you need to avoid, keep reading. We all love scented body products; we even associate those scents with being clean. Unfortunately, the fragrances of those products aren’t natural. They contain a hydrocarbon called toluene. This chemical is found in most bath and shower necessities, meaning millions of Americans are exposed to it daily. Toluene has been known to affect developing fetuses, cause liver and kidney damage, and cause anemia. Triclosan is the chemical used in shower products to kill germs. While we all want to be clean and germ-free, using a chemical like this takes it to an unnecessary level. Antibiotic resistance is an issue caused by exposure to chemicals like triclosan because our bodies build up an immunity to antibiotics and other chemicals. If we’re immune to antibiotics, we can’t be treated for virus-related illnesses. After recent backlash in the media, more and more shampoos are advertising being paraben-free. This is an awesome development because parabens can seriously affect your health. They mimic estrogen in your body leading to extra fat storage, male breast growth, and hormonal disorders. Methyl parabens can even cause neurological disorders. In a world where everything seems to give us cancer, bath products are a category where you can control your exposure. 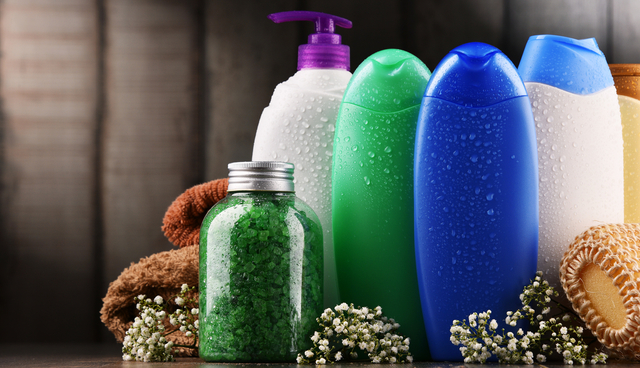 Many products contain DEA, a harmful chemical that creates a severe carcinogen when combined with other common shower product chemicals like nitrate preservatives. This dangerous chemical is used in bath and shower products in addition to paints, varnishes, engine coolants, and antifreeze. Why would you want a chemical involved in car maintenance slathered on your body? Propylene glycol can cause kidney and liver issues, dermatitis, and other skin irritations. Almost every shampoo, skin care product, and body wash on the market right now contains sodium lauryl. Unfortunately, sodium lauryl is a known carcinogen when combined with dioxane as it is in bath products. It can cause organ toxicity, endocrine disruption, and reproductive toxicity in addition to cancer. Choose natural skin care, bath, and shower products whenever possible. Shower and bath products use the chemical dioxane because of its easy absorption into the skin. Although it originally derives from coconuts, there’s nothing natural about this chemical. It’s known to be toxic to your nervous system, kidneys, liver, and your brain. Packaging that advertises being made from coconuts are usually taking advantage of this deceiving chemical’s origin. Interested in Bath and Shower Products That Are Safe to Use? We shouldn’t be at risk for cancer and other serious health concerns every time we shower. We deserve safe and healthy products that improve our skin, hair, and body’s vitality. If you’re interested in learning more about bath and shower products that are 100% safe to use, check out our products page. Previous Post:Special Report: Are Wax Warmers Safe to Breathe?